Here are a couple of pictures. I went with a custom subframe so I could keep the stock hood. I love this engine. Anyways, not the best pictures but I figured I would share. Nice FD! I like the wheels. get some more pics up asap. Any Specs? Power figures? Mod list? Looks super clean! What's your ground clearance like? How did you handle the rack relocation? We notched out the hood frame as much as possible to get the motor as high as possible. The rack was probably lowered less than an inch. I used the Hinson Supercars bumpsteer kit to help compensate for the lowered rack. I was very leery about lowering the rack, but I feel that it is safe and seems to handle just fine. More pictures are on the way. Some good ones this time. Ground clearance isn't too bad. You have to be careful going up slopes and stuff, but I think my S2000 was lower. I was actually surprised. I'm guessing that I am at about 280-300hp at the wheels. We also removed a bunch of the random plumbing on the turbo side and used a much basic intercooler piping system. With these few mods I am making 14lbs of boost. I'm hitting full boost by 3000 rpms. The torque curve is amazing! I love this motor. The downside would be that the aftermarket is difficult to navigate in the US. Any shots of the engine mount setup/crossmember? I know exactly how far the rack and subframe need to move and I was leary as well. From the first couple pics, it definitely looks clean. I always wanted to do this conversion, and like you only want to use the stock hood. But everyone has said you either have 2 choices, get bumpsteer, or use aftermarket hood. SO you have no problems with bumpsteer at all??? I dont think that I have a problem. We have the engine as high as it can possibly go. The steering rack was only lowered about an inch, if that. I have the Hinson Supercars bumpsteer tie rods and they help return the steering geometry back to stock (or close to it). Do I have a slight amount of bumpsteer? Maybe. Does my car steer exactly as it did stock? Maybe not. Have I ever noticed anything that remotely resembled bumpsteer or ever felt that the car was unsafe? No. I have had the car very fast and it has always been predictable and stable. Nicee,I can't wait till my boy gets done with his 1jz swap in his 240sx. I know this is an old thread but I'd really like to see those pictures! 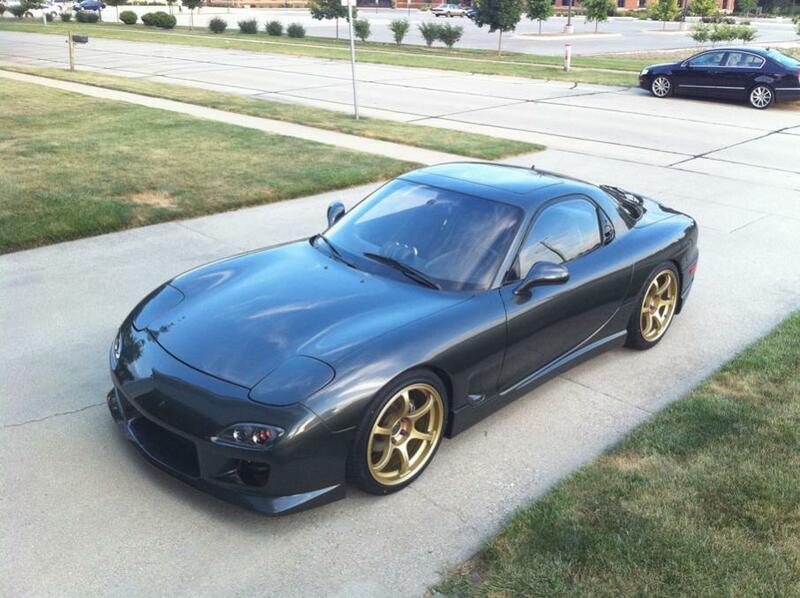 RX-7 w/ RX-8 Renesis Rotory Engine?